After the release of his 2009 album WESTERN BELL lead to a mixed response from industry and fans alike, Kelly Joe Phelps withdrew from the spotlight to undertake a period self reflection and evaluation. The conclusion was to hark back to his Christian roots and hone in on developing his song writing skills to complement the undoubted virtuosity of his guitar playing. 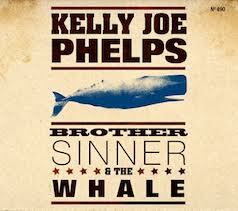 The result is a revitalised Kelly Joe Phelps and a brand new twelve track album titled BROTHER SINNER AND THE WHALE. Although a citizen of the U.S. and a long term resident of Washington State, Phelps nipped over the border to the studio of Vancouver based producer Steve Dawson to complete this blues tinged spiritual old time gospel recording that is sure to connect well with his fan base. Throughout his career, which has seen numerous recordings since 1994, Phelps has strived to re-interpret the old jazz, blues and country sounds that form the roots of modern guitar music and his slide and bottleneck playing styles are very much the central feature of the tracks laid out on this new record. Apart from the re-working of the traditional gospel song ‘I’ve Been Converted’, Phelps has contributed the lyrics to all the other tunes except logically the instrumental number ‘Spit Me Outta The Whale.’ With song titles such as ‘Pilgrim’s Reach’, ‘The Holy Spirit Flood’ and ‘Guide Me, O Thou Great Jehova’, you are left in doubt of the subject content of the album. Kelly Joe Phelps was last seen in the UK as the musical partner of Californian singer songwriter Corrine West. During their live shows he came over as quite an introverted character and this is reflected in the intensity that comes across in the new recording as well as the low key vocal style adorning each track. Whilst it is straightforward to appreciate his technical musical skills, the listening process can be quite a strenuous activity and is certainly something that demands your sole attention. Like so many albums of this nature it is probably best explored in a relaxed mode and, with no real standout songs that plant themselves in your mind, enjoyed in its entirety rather than dipped into. It will certainly be well received by those previously aware of his work and may also leave a positive impression on those who like to experiment with live roots music and venture out to one of his intimate shows coming to the UK in the New Year.